It doesn’t say “For Now” at the end. We’ve been here before so many times that the premise is almost laughable. Today’s politicians are interested in only one thing … getting re-elected. Which is why I’m already planning for the next shutdown. The situation reminds me of five-year-old children on a school playground. Everything goes along swimmingly until there’s a disagreement over who gets to play with what toy. Then comes the squabbling, the bickering and the flushed cheeks. Frankly, I’d like to give every politician inside the Beltway a “timeout.” The constant hand-wringing, posturing partisanship is getting old. Worse, it’s very dangerous for your money. Only it’s never as bad as the mainstream press would have you believe. According to LPL Financial, the median drop during government shutdowns since 1976 – some forty-three years ago – is 0.0% while the average is just -0.6%. 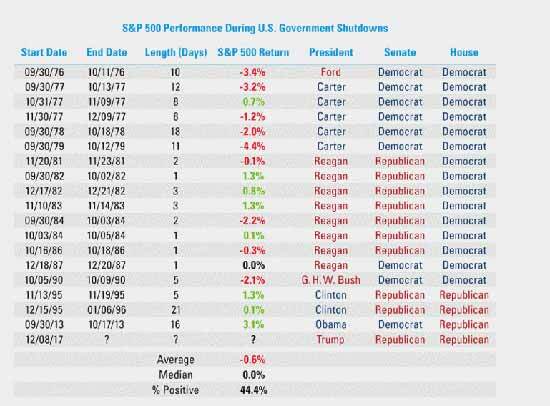 Government shutdowns results in positive market performance 44.4% of the time. Nearly half! Source: LPL FinancialThat catches a lot of folks by surprise because they’re focused on the “worst” when market history shows beyond any shadow of a doubt that planning for the “best” is far more profitable. You’ll feel a whole lot better knowing that your money is still hunting for big profits when the next shutdown hits … even if “this” one’s seemingly been averted as I type. My favorite choice is the Vanguard Wellington (MUTF:VWELX). I call it my “desert island fund” because if I had to go to a desert island for 100 years and leave one investment for my family, confident that they’d be well off, it’d be the Wellington. Created in 1929, the Wellington is one of the single longest-lived mutual funds in existence which means that its management has actually lived through key market moving events today’s freshly minted financial advisors read about in history books. I like that because there’s plenty of perspective and experience driving key investment decisions. The other thing to think about – even if politicians would rather you not – is that the Wellington offers built in “safety-brakes” via an allocation that’s roughly 65% stocks and 30% bonds at the moment. Adrenalin junkies need not apply…but might want to anyway. The Wellington has had plenty of double-digit returns since the original recommendation in our sister service, The Money Map Report. Every $10,000 invested could have doubled and then some to $21,413.58 since we first recommended it. What’s more, the fund offers a very attractive 8.23% average annual return since inception. To put that in perspective, current financial planners are being encouraged to use 4%-6% as a “realistic” assumption. I realize that may not sound like a lot – the 8.23% part that is – but every $10,000 invested when the fund started would be worth $11,577,580.37 today. That’s an astronomical 115,675.80%! Investors tell me frequently that they don’t “have the time” to invest in a fund like the Wellington when I bring it up this kind of information which is too bad because it demonstrates their own ignorance. Usually I shoot back pretty directly asking … do you have 5 – 10 years? Because top holdings like Microsoft Corp. (NasdaqGS:MSFT), JPMorgan Chase & Co. (NYSE:JPM), Bank of America Corp. (NYSE:BAC), and Alphabet Inc. (NasdaqGS:GOOGL) have tacked on 564.7%, 166.8%, 158.3% and 555.6% respectively over the past decade. What’s more, the minimum investment is only $3,000 and the expense ratio just 0.25%. Both of which mean that more of what you earn is going into your pocket. And that’s, of course, kinda the point. PS: Many investors are under the impression that the Vanguard Wellington Fund is “closed to new investors” because that’s what their brokers tell them (in the interest of selling something else that will generate a big fat commission check). That’s not correct. Vanguard closed the Wellington to new accounts from financial advisors and institutional customers effective February 28, 2013. But new accounts from individual investors are welcome and encouraged. The post How to Play ANOTHER Government Shutdown (When it Happens) appeared first on Total Wealth.